Please be aware that the River Calder at Sowerby Bridge is not sterile, like our tap water, but is ‘natural’ and is likely to have quite significant levels of bacteria and fungi as well as fish. To minimise risk of illness arising from water borne organisms do not drink the river water, and ensure that you wash or shower after each paddling session and wash your paddling gear. 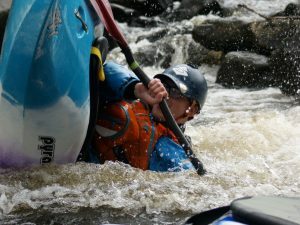 Paddling is a wet sport and you will get splashed and occasionally immersed, accidentally or deliberately. If you do get immersed ensure you keep your mouth closed. The Environment Agency do not recommend swimming in any urban rivers, but do advocate the above precautions for river users like ourselves and firemen whose work or sport does bring us into contact with the river. If you do become ill with a stomach related condition, seek advice from your doctor. To add a little context, the river at Sowerby Bridge does have a lot of trout and this is a sign of a reasonably good biological quality, and indicates that our stretch is of better quality than a lot of other urban rivers. Risk from water borne organisms is reduced during periods of rain when the river is fuller and hence dilutes the organisms, and conversely is higher during drier periods like this summer. Awareness of these water quality issues and the simple precautions will improve your paddling experience. If you have any further concerns or questions please contact the club access & environment officer.